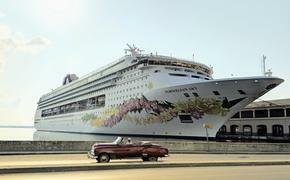 Norwegian Cruise Line’s Norwegian Sky on Jan. 1 rang in the New Year and the 100th birthday of passenger Zara Holtz, a Fort Lauderdale resident originally from Queens, N.Y. Holtz was sailing on board Norwegian Sky with her son, daughter-in-law and grandchildren. To commemorate her 100th birthday, Norwegian Sky’s more than 2,000 guests were invited to the pool deck for a special sail-away party. There, they witnessed Master Ice Carver Ronaldo carve an enormous block of ice into a huge “100.” Then, Holtz was brought on stage, presented with a birthday cake and saluted by her fellow guests, officers and crew who sang “Happy Birthday” in her honor. The celebration came as a complete surprise to Holtz and her family. When asked to say a few words to the crowd, she said she never expected to live to 100 and wished everyone the same. A former travel agent, Holtz has traveled a great deal, and she closed her speech by saying she wished everyone could sail on their birthday. Following her pool deck celebration, Holtz and her family were invited by the captain, officers and crew to a birthday dinner in Cagney’s Steakhouse.